A workmanlike, affordable guitar with a unique sound - a hybrid, raw Tele-esque tone with a little more squash. Once tamed with the tone control it's lively and a little punky - just how we like 'em! Original style; tidy construction; earthy sounds. Pickup heights needed tweaking; incorrect tone capacitor. The birth of St Blues goes back to the late sixties when Charles Lawing and Tom Keckler were working at Mike Ladd's Guitar City in Memphis, on what is now Elvis Presley Boulevard. On a Led Zeppelin tour Jimmy Page had the duo overhaul some guitars and they even built a one-off as a gift to Elvis Presley from his father, which he can be seen playing in Aloha From Hawaii. They designed the original Bluesmaster, which was sold by Strings And Things in Memphis, before Keckler left to help start Schecter Guitars in Los Angeles. This eventually led to the creation of the St Blues guitar line in 1985 that was distributed throughout the USA and lasted until 1989. The brand attracted a number of big-name users - among them Eric Clapton, Billy Gibbons, Rick Derringer and Psychedelic Furs' John Ashton - and was resurrected by Legendary Gear, with Keckler and Lawing as advisors, in 2006. In terms of reference we have little to go on but the Mississippi Bluesmaster is still as pretty as we remember. It's also quite petite as the lower base of the Les Paul-esque single-cutaway outline is flattened off creating a more angular, Fender-inspired element to the design. Hardly a classic, of course, but it is immediately memorable. The two-piece centre joined mahogany body is standard Tele thickness at just over 45mm. It's edged with a single-ply cream binding to the top and back and there's no comfort contouring at all. The front face is black-painted, the back, sides and neck are all left natural. Unusually, mahogany is selected for the 628mm (24.75-inch) bolt-on neck - fixed to the body in standard style with rectangular neck plate. The one-piece neck has a good 'C'-shaped profile that's chunky but well carved and not overly big. The rosewood 'board is cleanly executed with medium gauge frets (approx 2.4 x 1.2mm) and although a little more TLC to the fret ends and fingerboard edge would really improve the feel, for the price it is all more than acceptable. There's a general attention to detail, however, that's impressive. The 'saftipost' vintage-style tuners are a perfect choice while the fixed Strat-style bridge has tracks for the outer saddles to stop any movement. The pressed steel saddles have slight V'd string break points to stabilise the string spacing and, importantly, the saddle height screws don't protrude above the saddles. It's nickel-plated too giving a nice unified vintage vibe. Another minor point is the strap buttons are of a large diameter, not the standard Korean fare, which should help to keep your strap firmly fixed to the guitar. 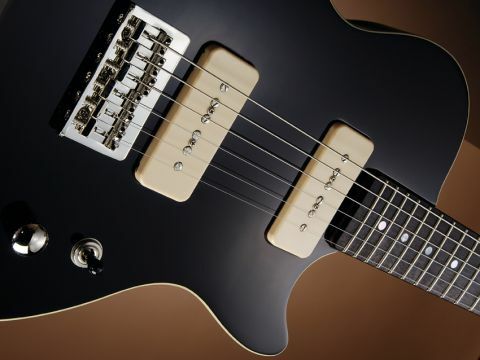 The Mississippi Bluesmaster is available with both open-coil humbuckers or soapbar P-90-style single-coils as here. The rear-mounted controls are laid out Tele-style with a three-way toggle replacing the Tele's three-way lever; both the volume and tone have knurled Tele-style knobs and the squared, thin-metal output jack is side-mounted. The wiring cavity is neatly shielded with paint and foil and it's all tidily done - a seemingly minor detail but one that gives the impression of thought-through quality. Just as the construction is a hybrid of different styles, so is the sound. It's very comfortable and lightweight strapped on - a good guitar to gig. As we've often said a good P-90 and strong Tele pickup can sound pretty similar, and here we get a good example of that Tele/P-90 stew. The bridge pickup needs some tone control taming; as supplied it also needed a little more push compared to the louder and fuller neck pickup. As usual with P-90s there's not a great deal of adjustment to be had, but by pulling down the neck pickup as far as we could and raising the bridge unit things sound more balanced. So there's Tele-like twang and chunk aplenty but strong hints - especially from the neck pickup - of the wiry, edgy-yet-smooth P-90 tone that impresses us every time. Wind down the volume and the twin pickup mix offers textured Fender-funk - and it's hum-cancelling - wind up the wick again and wail. Only the tone control, fully 'off', lets the performance down with an unusable waffley tone instead of a nice 'woman tone' bark: sounds like the wrong value capacitor to us. Overall though this guitar suits blues, country and twang-some rock, and does it all with some very welcome character.